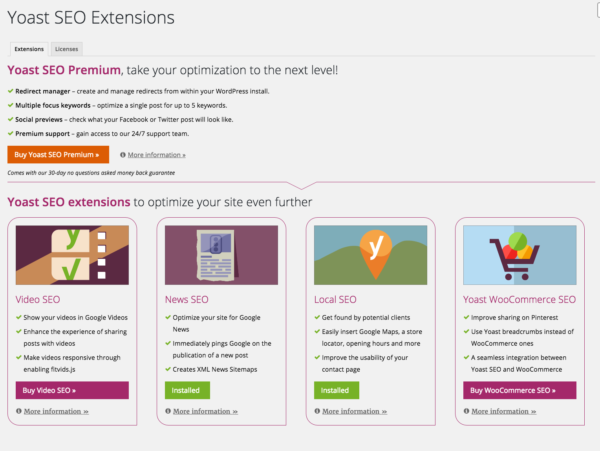 We’ve just pushed out a new release of Yoast SEO, our flagship plugin. The new version, 3.5, mostly has a metric ton of small bugfixes. In this post, we’ll discuss the most notable changes, but you should mostly be aware that this is what we would call a bugfix release. We’ve decided to remove the change frequency and priority variables from our XML Sitemaps. Google has said publicly that they don’t use them on most sites. Private discussions with Googlers have led us to believe there’s really no compelling reason to keep them around. This change makes XML sitemaps faster and easier to generate. There are plugins out there that allow you to change the priority and change frequency of just about everything. We really do not believe that adds any value whatsoever. We’ve added Flesch reading ease compatibility for German and Dutch. This doesn’t just mean we’ve enabled it for those languages. The Flesch reading ease test needs to change because each language is different. If you’re interested in the technicalities, this ticket has the formulas. To be able to do this, we need to be able to recognize syllables in words. We’re working on adding this for more languages, but as you can imagine that’s a fair bit of work. This comes on top of the changes in 3.4, where we added support for transition words checks for German as well. This means German and Dutch writers will now get a score that is meaningful for their language. Yoast SEO outputs JSON+LD metadata on the page. This metadata informs Google about whether this is a site for a person or a company, what your social profiles are, etc. This change, which is admittedly a bit more on the technical side allows other plugins to tie into our metadata. They can output pieces of JSON+LD metadata and combine them with ours. For instance saying “this is extra info related to this organization”, where “this organization” is a pointer for our organization info. They can do this by referencing the @id‘s we’ve added, something that wasn’t possible before this change. We’ve, again, made many internationalization (i18n) and accessibility (a11y) improvements in this release. From making sure everything is translatable to adding descriptions and adding more explanation everywhere. The full changelog is available on WordPress.org, if you see anything in there that you’d like clarification on, let us know in the comments!